The Special Investor General for Afghanistan Reconstruction, or SIGAR, noted a significant decline in the Afghan government's ability to govern the district, a decline of about 16 points. Total Afghan government control stands at 55 percent, the lowest number since November 2015. Insurgent control and influence over key regions has risen about 5.5 percent, according to the report, which highlights the U.S.-backed government's growing inability to retain influence in areas it once maintained control of. The ongoing decline in the Afghan government's control over key territories is awakening new concerns among security officials and others who have warned that the Taliban is experiencing a resurgence despite the United States pumping billions into Afghanistan reconstruction effort over the past decade. Independent Afghanistan experts have confirmed in recent weeks, based in part on government data, that just over half of the Afghan population is outside of the government's control. Civilian casualties also have been on the rise, according to SIGAR. 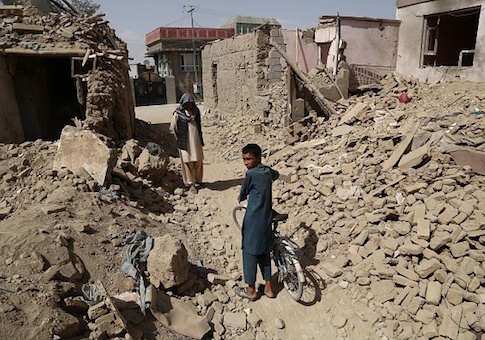 There have been 650 civilians casualties as a result of aerial operations by pro-Afghan government forces from Jan. 1 to Sept. 30 of this year, a 39 percent increase from the previous year, according to SIGAR. The Afghanistan National Defense and Security Forces, or ANDSF, also continue to struggle, hitting the lowest personnel levels since recording began in 2012. "ANDSF strength decreased by 1,914 personnel since last quarter and by 8,827 personnel since the same period last year," according to SIGAR. "The ANDSF is roughly 40,000 personnel, or 11%, below their target strength of 352,000 personnel." Continuing problems in the ANDSF, including its inability to recruit, are in part responsible for the Taliban's resurgence in key territories. While the "exact strength data for female personnel in the ANDSF this quarter" remain classified by the government, "reported efforts to recruit women for the ANA are currently on hold," SIGAR reported. Afghanistan experts with the Long War Journal, a publication that examines U.S. operations across the globe, also have warned that the Taliban is rebounding. "Even if the Afghan government could secure more of the population, territorial control remains a key source of the Taliban's resilience," the publication recently reported. "As Long War Journal has consistently demonstrated, the Taliban uses rural areas to recruit fighters, operate training camps, tax the residents, spread its radical ideology, and launch attacks on more populous areas under government control." Afghanistan's opium trade continues to thrive despite the United States investing millions of taxpayer dollars into counter narcotics operations, SIGAR found. "From 2002 through September 2018, the United States has committed an average of more than $1.5 million a day to help the Afghan government combat narcotics," according to SIGAR. "Despite this, 2017 poppy cultivation is more than four times that reported by the UNODC for 2002, the first full year of the U.S. intervention in Afghanistan." SIGAR also warned the counter narcotics operations appear "to have fallen completely off the U.S. agenda," despite the millions invested in such efforts. "The State Department's new ‘Integrated Country Strategy' for Afghanistan no longer includes counternarcotics as a priority, but instead subsumes the issue into general operations," SIGAR reported. "Meanwhile, the U.S. military says it has no counternarcotics mission in Afghanistan, and USAID says it will not plan, design, or implement new programs to address opium-poppy cultivation." This entry was posted in National Security and tagged Afghanistan. Bookmark the permalink.